S and J Majestic Soaps – Homemade soap just like Grandma used to make! WELCOME TO OUR NEW WEBSITE- now offering free shipping on orders over $35! 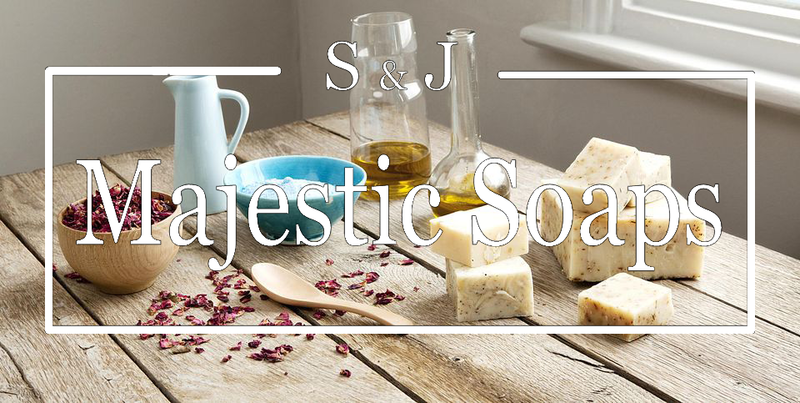 S & J Majestic Soaps has gone back to basics just like grandma used to do. We offer an all natural homemade lye soap with no chemicals or preservatives which provides a superior moisturizing experience. By using a natural product you will have healthier skin and you will help keep the environment healthy, too! Our soaps are made with six natural oils (coconut, palm, rice, apricot, castor & olive oils) using only the finest ingredients. You will find that it lathers up and turns into a nice creamy lotion to keep your skin moisturized whether you are using it in the bath, shower, to shampoo your hair or to shave with! We have scents that will surely satisfy everyone and even offer an unscented for those who have the most sensitive noses. You will also love that we offer top-notch customer service along with our top-notch soaps. We stand behind our product 100%! You will find our top-selling scent Lemon Honey in the fruity category and many more like Sweet Orange and Paradise. If you like fruity scents this one has you covered! With scents like Snow Angel, Seaweed, and Rain the soaps in our lightly scented category are sure to please just about anyone anytime of year! The bars in our functional soaps category contain things like: bug repellant, unscented bars, and polishing bars with (gluten free) oatmeal. Orders ship out in 3-5 days of receipt. If any delays will occur we will inform you of the delay by email. Please read the terms and conditions section of this website listed under the customer information tab. By using our site, you have consented to these terms.